20 July 1916 admitted to Northumbrian Casuality Clearing Station - scabies. July 1916 to hospital - sick. 1 October 1916 at Somme - gunshot wound to head. Albert Edward Bennett Saunders was the eldest son of Lionel and Sarah (née Bennett) Saunders, of Rakaia, Canterbury. He was born on 9 August 1896 at Pleasant Point. Lionel attended schools at Outram, Momona and Mount Cargill in the greater Dunedin area, with an eight-month spell at Pleasant Point in 1901-1902, before completing the majority of his education at Rakaia. After his schooling Albert was employed at the Rakaia Post Office for two years before he volunteered for war service. Albert Saunders was just 19 years 2 months old when he enlisted on 19 October 1915, for the duration of the war. He had registered to join the artillery at the Ashburton Defence Office on 22 July 1915, being the only man to do so at that time when recruiting was rather slow, and spent his 19th birthday at Trentham. He was by then employed as a butcher at Ashburton. With the infantry he was to leave Timaru on 13 October 1915 to go into the training camp, but it was the 18th when the quota left for Trentham to join the ninth Reinforcements. A large crowd turned out to see off Albert and 76 others at Ashburton. The men, “who were mostly of fine physique, and altogether of the stamp required,” fell-in at 4 o’clock at the drill shed, where they were treated to a good repast. On behalf of the town’s folk, the Rev. George Miller addressed the men – “They were going to do their level best in the righteous cause. . . . . Besides their own strong arms and their guns, they needed the Almighty to help them through.” After three hearty cheers from the crowd, the soldiers marched to the railway station, headed by the Ashburton Citizens’ Defence Corps Band playing martial airs. They joined the 200 or 300 men from Timaru and places north on the express. The train left to more cheers mingled with the strains of “Auld Lang Syne”. Albert was single, of Church of England adherence, in good physical condition though, naturally, of slight build, and was serving with the General Training Section of the 2nd South Canterbury Regiment, which he left to join the Expeditionary Force. His nominated next-of-kin was his mother, Mrs L. Saunders of Rakaia. On 8 January 1916 young Albert embarked at Wellington on the “Maunganui” with the Canterbury Infantry Battalion of the Ninth Reinforcements. Having reached Suez on 8 February, he joined his battalion and on 7 April embarked on the S S “Canada” at Port Said for France. On 20 July he was admitted to the Northumbrian Casualty Clearing Station, suffering from scabies. Two weeks after rejoining his battalion he was sent to hospital – sick, and admitted to the No. 2 New Zealand Field Ambulance. Not long after his 20th birthday, which was spent in the trenches, Albert Saunders was listed among a large number of wounded. He had suffered a gunshot wound to the head on 1 October 1916 at the Somme. He was admitted initially to the XV Field Station then transferred to the No. 26 General Hospital at Etaples. A month later the news was better – Private Saunders had been discharged from the base hospital in France on 17 November. He got to spend seven more months in the Field, but all too soon the worst news came through – Albert Edward Bennett Saunders had been killed in action on 7 June 1917 at Messines. Although the Battle of Messines was a striking success, the New Zealanders paid a heavy price for success – a price paid in the life and future of young Albert. Private Albert Edward Bennett Saunders was buried at a point just west of Messines. His name is inscribed on the Messines Ridge (New Zealand) Memorial in the Messines Ridge British Cemetery, West Vlaanderen, Belgium. He was a grandson of Mark Saunders of Pleasant Point, well known for his endeavours to generate power from the ocean waves; and a nephew of Charles William Saunders, who died of typhoid in 1915 at Alexandria, and of Mark Saunders who was killed in action in October 1917 at Passchendaele. A third uncle, Eustace Saunders, enlisted for World War I service. 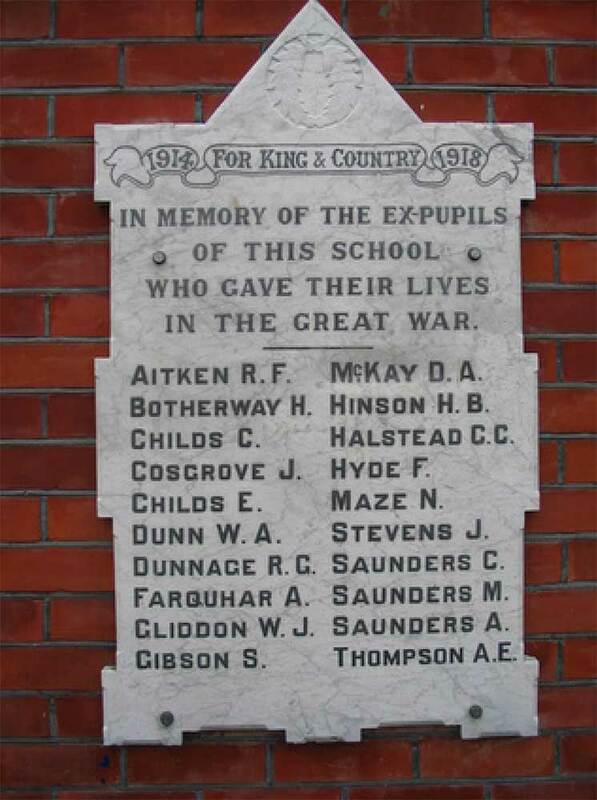 Albert, Charles William and Mark are all remembered on the Pleasant Point School War Memorial. Albert’s name is also recorded on the Timaru Memorial Wall, the Ashburton War Memorial (as A. E. B. Saunders) and the Rakaia War Memorial (as A. Saunders). Albert Saunders was remembered as a quiet, unassuming man, who was held in high esteem by all who knew him. He left a soldier’s short form of Will, leaving half of all he possessed to his mother and half to his father. His medals – British War Medal and Victory Medal – were sent to his mother, the memorial plaque and scroll to his father. A portrait of Pte A. E. B. Saunders was printed in the Auckland Weekly News, 1917, and another in civilian dress in the Otago Witness of 18 July 1917. Anzac Day was fittingly celebrated in Timaru on 25 April 1920, when solemn tribute was paid to the honoured dead. A large wooden cross was erected on a rockery and a large laurel wreath, carrying the words “In memory of our fallen comrades”, was placed by the Returned Soldiers’ Association at the foot of the cross. In his address Pastor Nichol paid a warm tribute not only to the men of Anzac but to all who had gone forth so valiantly to fight that we might live in peace and safety. During the playing of “The Dead March”, wreaths which had been sent were arranged at the cross. Among these were wreaths in memory of a young man and his two uncles - Albert Bennett Saunders, C. W. Saunders and Mark Saunders. The Battalion Band played the “Last Post” and the ceremony closed with the National Anthem.